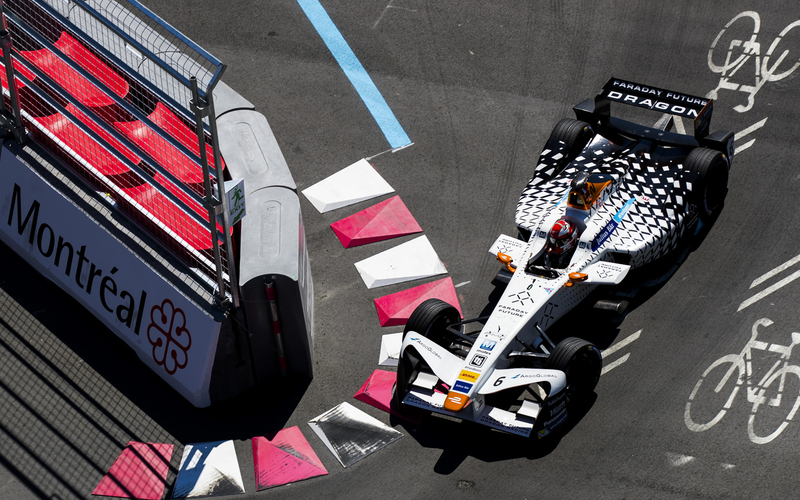 Hoping to score some more points in the championship battle with Andretti Formula E, the Faraday Future Dragon Racing squad was aiming high in Montreal. Even though it looked like it would become one of their more successful weekends this season, they only secured three points in total in the end. It has been a difficult season for the Penske-run team. Going into the final race weekend of Season three, they were tied on points with Andretti Formula E, whose season has been undeniably torrid. Dogged with issues and with some amazing opportunities missed (Jerome d’Ambrosio’s close-miss on a podium in Mexico) as well as occasional teammate clashes, it has been a tough one. Montreal was not to turn that around – d’Ambrosio suffered issues in group qualifying that sent him straight to the back of the grid and Loic Duval was outside the top ten in a competitive field. The race was to continue in this vein, with Duval coming off the better from a clash with Heidfeld but not recovering. Although coming off better in a clash with Nick Heidfeld (Mahindra Racing), Loic Duval’s race was marred by the incident and despite D’Ambrosio’s position improving, neither finished in the points – or at all, in Duval’s case. Nevertheless, Duval collected a point for the Visa Fastest Lap. On a day that could really only see improvement, it was not entirely to be for Faraday Future Dragon Racing. Qualifying saw d’Ambrosio match Duval’s position yesterday in 11th, with his teammate two places behind. The race yielded points with a 9th place finish for d’Ambrosio but Duval’s drive was once-again incident strewn, ending two laps down. A grimly marred qualifying saw Jerome d’Ambrosio without the pace to do anything other than start from dead last, no driver’s favourite position. 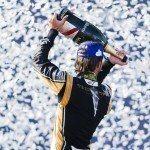 Already signed for next year by the Faraday Future Dragon Racing team, d’Ambrosio perhaps had less of a job to do this weekend, except in terms of the race from the bottom to outscore Andretti Formula E for the season. Despite not managing to contribute any points to that end, d’Ambrosio managed to gain eight places to 12th during the race and outperformed his teammate’s DNF. Not starting from dead last has to be seen as an improvement, with d’Ambrosio qualifying 11th. Managing to avoid most of the early incidents, he was able to move forward into the points for a 9th place finish. Maybe not the podium that looked likely earlier in the year but a solid enough result for a forgettable weekend across the team. A frustrating season for Le Mans winner and Endurance champion Loic Duval was not set to improve in Montreal. Although outqualifying his teammate and collecting a point for the Visa Fastest Lap, Saturday was largely a race to forget for him after a clash with Mahindra Racing’s Nick Heidfeld left him able to continue but uncompetitive. 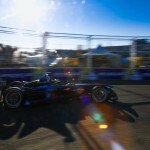 Further frustration for a driver whose schedule has been unexpectedly disrupted this year (Audi factory driver Duval was moved to competing in DTM following the team’s withdrawal from the World Endurance Championship, ironically to focus on Formula E) is probably not the way Duval would have liked to round off what might be his last season in Formula E. But another series of incidents left him unable to even grab the fastest lap point and finishing second-to-last, two laps down.